There’s been buzzer-beating shots, upsets galore, and some Cinderella runs by some unexpected teams. 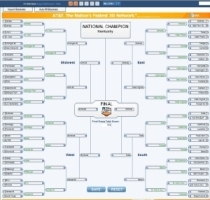 Still, in spite of all the March Madness, 17-year-old autistic teenager Alex Hermann has a perfect NCAA Tournament bracket. That’s right; he’s got 48 correct picks in 48 games. If he was 18, he’d be a millionaire; the top prize for a perfect bracket is $1 million dollars on Yahoo and a staggering $13 million dollars on SportsBook.com. Because the bracket was done on CBS Sports’ Bracket Manager, and not CBS Sports’ Bracket Challenge, there’s no way anyone can verify the legitimacy of this 1-in-13,460,000 feat of perfection. A simple check of the Bracket Manager shows that the results can be easily tampered with. The fact that no one else has done this (ESPN‘s leader has missed four games, and there are no perfect entries in CBS Sports’ Bracket Challenge) makes me believe pretty strongly that this is some kind of hoax. I wish I could believe in this story, but some things are too good to be true and we’ve seen the kind of stunts people will pull for a little fame and attention.